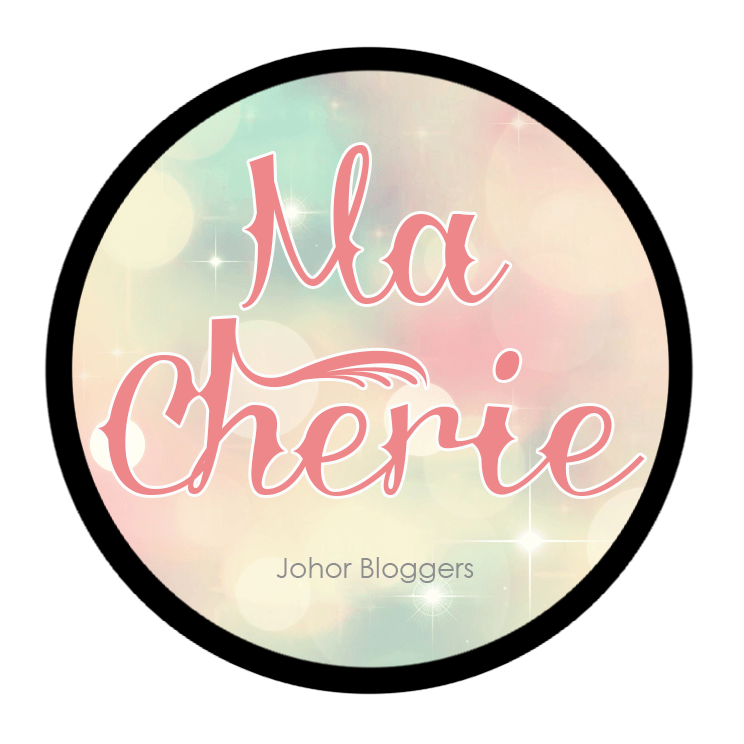 The reason why I insisted on attending this event (aside from going stale in JB and not attending events for months), is that I've been a Clozette user for quite a while now. However, I was unclear of what Clozette is all about since I was an inactive user (oops), so I really wanted to hear what the founders themselves have to say about this awesome site. Plus, it's always great to meet new people and catch up with other blogger friends at events! The first thing we did was register ourselves and we were each given custom printed name stickers to identify ourselves. Yea you know those "Hi, My name is..." stickers? Heh super cute. But my name was typed wrongly so in the end they gave me an edited, handwritten one. Lol. 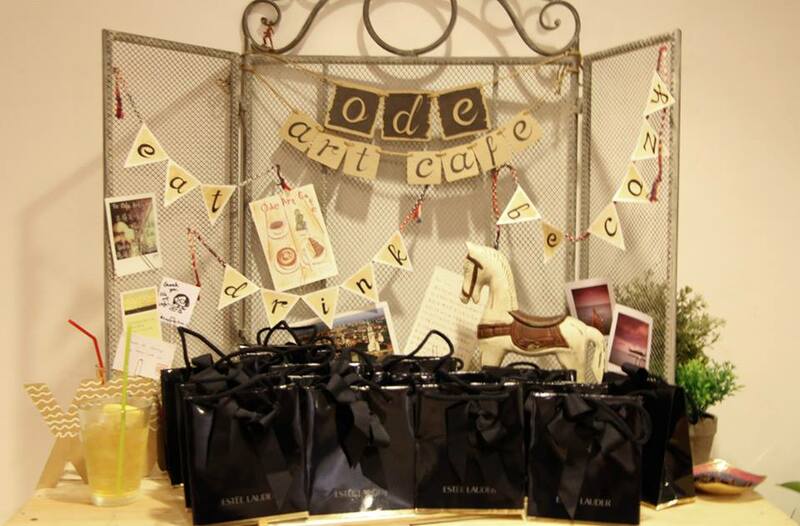 The event was held at Ode Art Cafe in SS15. It took me awhile to find the cafe and the UBER driver was really mean to leave me at the street in SS15 alone to find the cafe by myself. >:( Made me later than ever. Thank goodness I called Jane and she led me to the cafe with her instructions. The cafe is a quaint little space, yet spacious enough to host events or parties like these, comfortably. I loved the interior and atmosphere of the place as soon as I stepped into it. It's clean and spacious, with wooden and white brick walls as the main theme. Clean, but colourful, neat but messy (in a good way) at the same time. Guess what! No beauty party is complete without makeup and Estee Lauder has sponsored some goodie bags and lucky draw prizes for us girls. So excited, crossing my fingers real hard that I'll win the Modern Muse set I've been eyeing awhile now! 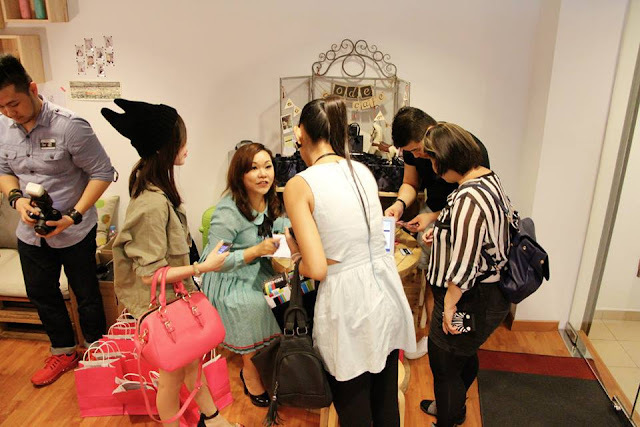 Also present was May 19, a blogshop that carries the trendiest Korean fashion. Korean fashion is perfect for a K-pop party, right? They have just recently launched but there are a few pieces that caught my eye already. The clothes are imported from Korea so there are not many ready-stocks. Still, their current collection is pretty, I can't wait to see more! Emcee Pauline was there to calm us girls down and open the show with a short speech. Kersie, one of the co-founders of Clozette and Creative Director was also there to tell her the idea behind Clozette. 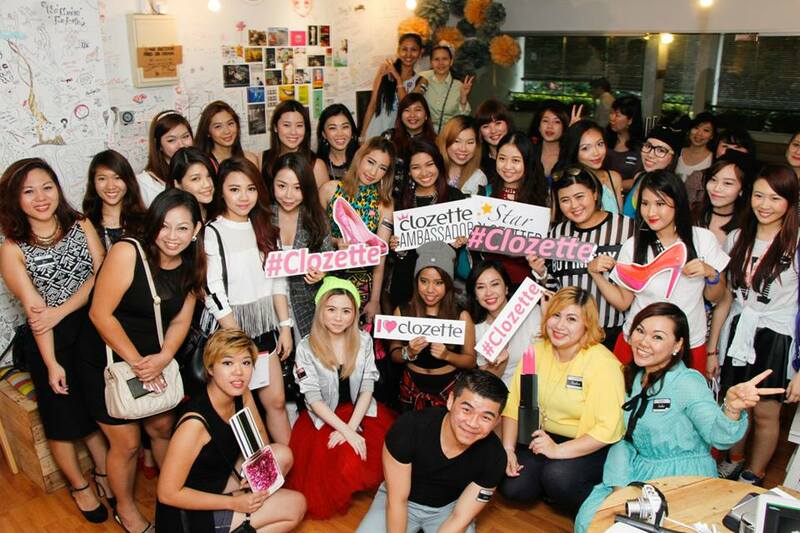 A little bit about Clozette, it was started in 2011 by a bunch of friends. Kersie wanted to marry her love for both social media and fashion and thus came up with an come up with an online portal and mobile web to catalogue fashion inspirations by fashion lovers alike. Clozette is a social network for women with a passion for fashion and has an opinion of style. 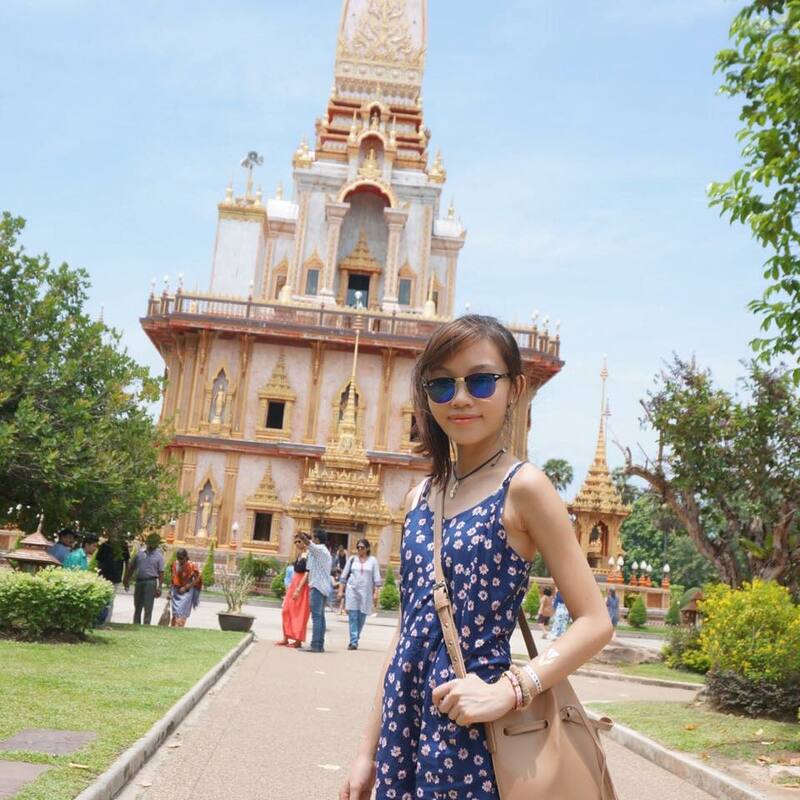 It is an image driven community and encourages users to not only share their #OOTD, but also love for beauty, lifestyle, shopping and travel. - Virtual wardrobe organising tool. - Online mix & match styling. 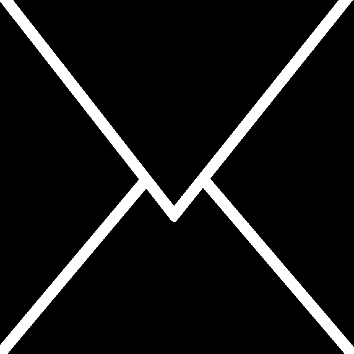 - Bazaar for users to buy or sell their items in a marketplace. - Uncover 'Shoppe', where Clozette team curates gems found from up and coming designers in Asia & Australia. - Works with various clients to come up with social media engagement for people with an online presence to participate in. After the short walk-through about Clozette, it is time for a makeup tutorial by Estee Lauder on how to achieve a K-pop look, no less! Model of the day was Felicia! Basically, what you need to know about Korean makeup is that it is clean, minimal, cute yet attractive at the same time. Not much foundation is used, but you definitely need the puppy-eyed look which can be achieved by drawing your eyeliner downwards (instead of drawing an upwards cat-eye winged liner), straight brows, tiny bright-coloured lips and blush blush blush! We had a mini quiz session after that. It was pretty simple for most because I realised many people are K-pop lovers? Questions were mostly about Korean bands, Korean dramas, etc which I TOTALLY have no idea about. But I still answered a question correctly because... It was about food. Yeap, the only thing I know about Korean culture is their food. XD Quite apt that my prize was a bag full of Korean snacks as well teehee. Finally, it's the session everyone was waiting for - Lucky Draw! The Grand Prize was the Modern Muse set and everyone was keeping their fingers crossed to win it. Lucky Alvynna and Shivani got it! Jess & Grace each got spa vouchers ahhh so lucky! The other prizes were sponsored by Amante, The Suisse Clini, Dr Nano Label and Blackmores. Group photo! Love this shot, everyone looked so bright and happy. We're all extra dressed-up too to suit the theme! 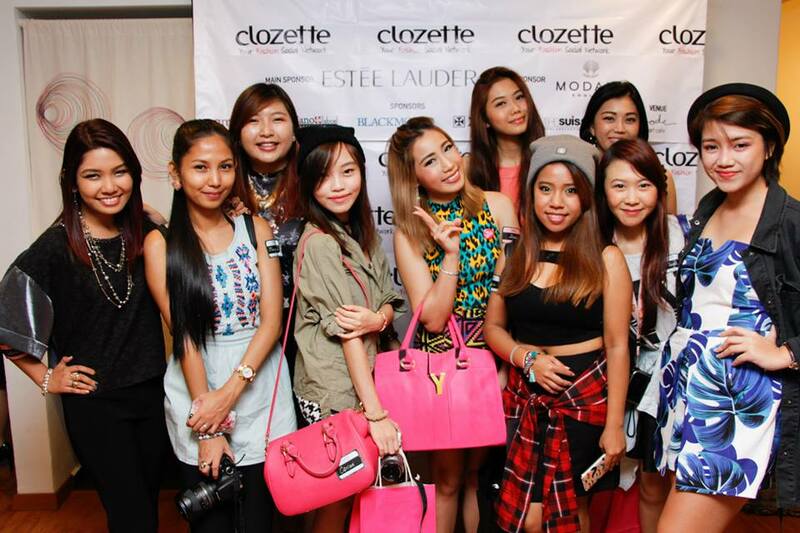 How apt, because fashion is what Clozette is about, after all. Spotted your fave K-popnista? Thanks to the photographer for this group shot! Find more photos HERE. 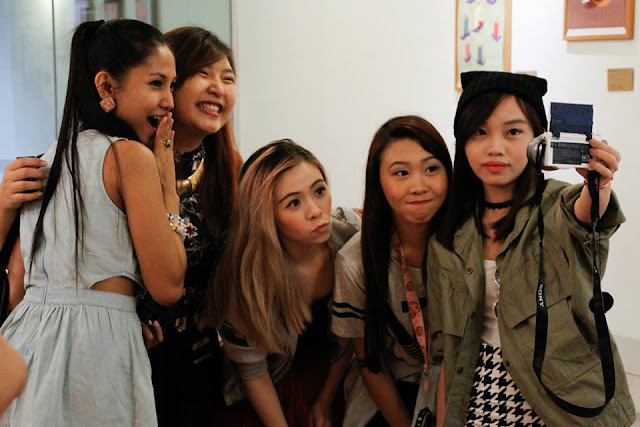 With them lovely blogger babes! <3 It's so nice to meet them again, and make a few new friends too! 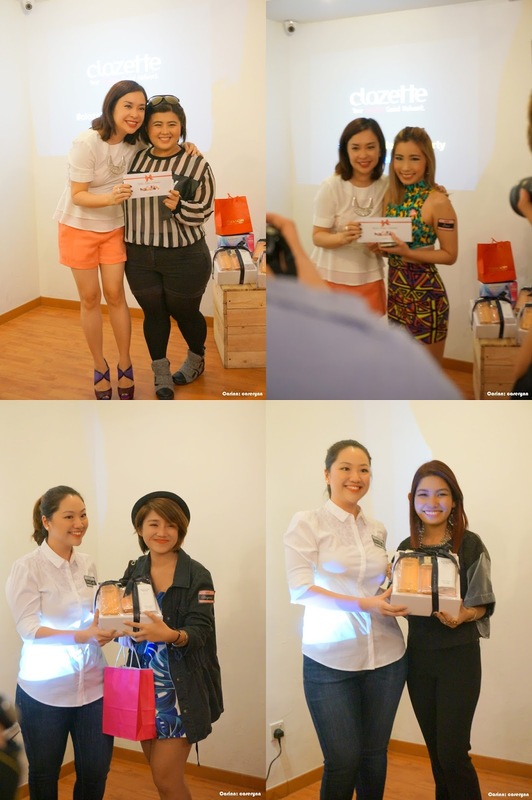 From left: Shivani, Alvynna, Claudine, Jessica, Jane, Nicole, mua. Hahaha love this! With adorable JQ! 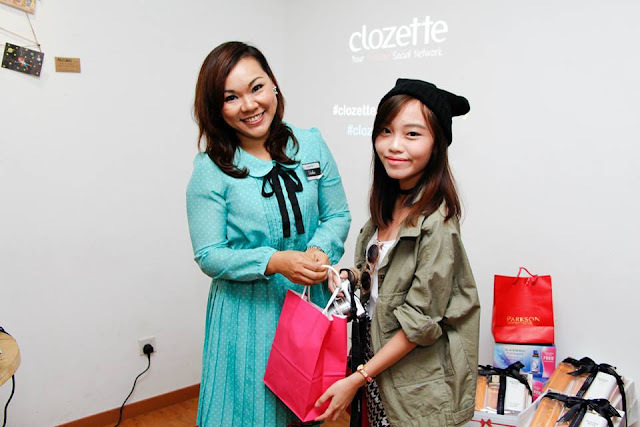 PS: Did I mention that I am now a Clozette Ambassador? I couldn't be more excited! You can find me HERE. My username is @carerynn. Feel free to follow me for more fashion, beauty and shopping-related updates! VOTE for my OOTD & find the inspiration behind it HERE! So happy you could attend this kind of event. I like your outfits too. look so cute! let me know if you follow me and I will follow you back! Thank you for the compliments! :) Sure thing, thanks for the follow!